Yes, definitely. 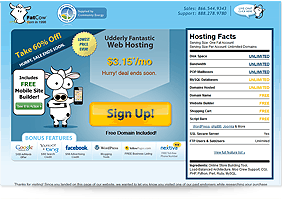 FatCow simply provides an easy, affordable platform to host your website. Their web hosting infrastructure such as web servers, DNS, etc. You can move your site to another provider at any time if you like. You own your site 100%. This is the same with all hosting providers. Imagine you rented an apartment and then purchased furniture for the living room. The apartment company simply owns the apartment building, and of course they don’t own your furniture. The same concept applies to web hosting and your website. FatCow started its business as a hosting service provider in 1998and has been one of the most sought afterweb hosts since then. The reliable and quality service that FatCow gives isone of the reasons why more and more clients opt for their service.In addition to this beneficial aspect, there are other equally useful and attractive features that users will enjoy once they signed up for Fatcow’s hosting plan and these are enumerated below. Is the free domain name offered by FatCow truly owned by you? The domain name you registered through FatCow is yours. FatCow only offered assistance in registering the domain name of your choice. In general, a domain name is only good for one year and you have to pay after this period if you want to keep your domain name.However, the decision is still in your hand, whether you can to take it up again or obtain a new domain name. FatCow also offers you options to have additional domains in order to attract traffic or more visitors to your website. The cost of one domain may be around $10 to $25 every year. What is your website ownership status if you choose to createit through FatCow? The website ownership belongs to you if you signed up for FatCow’s hosting service. Since you purchased their service,FatCow only gives assistance inputting up your page on the World Wide Web. FatCow has necessary tools for website creation, management and marketing and these are the aspects that you are paying for. Given that it is you who owns your website, you also have total control of it such as the elements that you want to be posted on your page. A good example of this is some advertisements to generate extra income for your website. What are your duties and obligations as a website owner? Owning a website also entails a few responsibilities and thisincludes your obligation to your web hosting company and your duty to manage and keep your website’s content up to date. Sort out marketing materials or advertisements and pick which of them is appropriate to be posted on your website.